During the holidays, family and friends can gather at Southern Indiana restaurants to enjoy world-class cuisine. Sample the Spiced Apple Wine from Huber Orchards, Winery, and Vineyards. This unique seasonal wine is the Huber family’s interpretation of classic spiced wines from its German heritage. The apple wine is integrated with aromas of cinnamon, clove, and nutmeg. Want more adult beverage choices? Visit our Craft Beverages page. 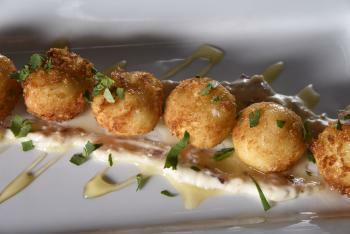 The Exchange Pub + Kitchen’s small and creamy goat cheese fritters sit atop bacon aioli and are drizzled with honey. Need we say more? 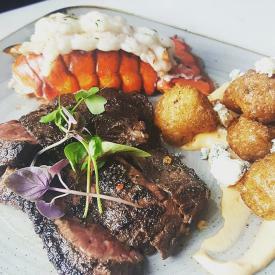 When you take your first bite of this appetizer at The Exchange Pub + Kitchen in New Albany, you’ll be in such a foodie heaven you’ll forget the decadence. Pair the flavors with one of the boutique wines, craft beers, or specialty cocktails selected especially by the Exchange’s staff. Try the roasted cauliflower from the Portage House restaurant in Jeffersonville, where you can dine with views of the Ohio River and the Big Four Bridge. Carve up this savory vegetable served with a lemon caper vinaigrette and dusted with chili flakes. Ever have a flaming dessert? Preparing this dish is no small feat, so leave it to the experts at Olive Leaf Bistro. 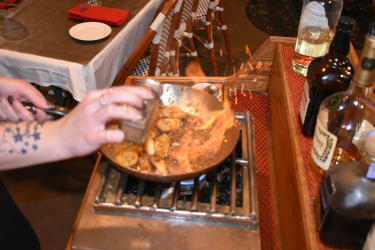 The staff will wheel a special cart to your table and set aflame a dose of banana liqueur to make its Bananas Foster Flambé. You’ll watch in awe before you taste the sweet bananas topped with cinnamon, dark rum, chopped walnuts, and more. The extravagant dessert originated in New Orleans, which was a major port of entry for bananas shipped from Central and South America.